German-born Bertold Bohmer was a competitive distance runner in his youth who has always dreamed of winning the Comrades Marathon, a punishing 54-mile race that stretches between two cities through a desert in South Africa. Bohmer never achieved this goal, and is now elderly and living in South Africa working as a trainer to help other athletes achieve their dreams. Bohmer is abruptly fired and replaced by a much younger man, Gasa. 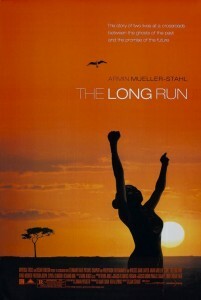 Bohmer is despondent until he discovers Christine, a young woman he sees jogging one day. Christine accepts Bohmer's invitation to stay with him and train for the Comrades, but she begins to chafe under his rigorous training program; furthermore, when Gasa hears about the remarkable new runner Bohmer has discovered, he tries to convince her to join his team.